Complex Lexical Items or CLIs are sequences such as comparable and proud of. They are complex, because they consist of more than one part, but they are also lexical items: they are likely to be stored as units in speakers’ linguistic repertoires. 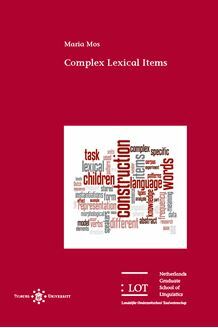 What people know about CLIs and how they use this knowledge, is the topic of this book. Taking a usage-based view of language acquisition, Maria Mos investigates children’s knowledge of Dutch CLIs in a number of online and of.ine experiments. Performance on these tasks is contrasted with frequency data from corpora and with adult performance. These studies investigate speci.c CLIs, but also seek to .nd out if evidence can be found for knowledge of underlying patterns. The experimental data are interpreted in the light of a model of Multiple Represen­tations, which draws on insights from the Construction Grammar framework. Because this book combines corpus and experimental data on a topic at the crossroads between lexicon, morphology and syntax, it is of interest to linguists coming from diverse scienti.c angles. The analyses convincingly show that it is necessary to assume that both concrete CLIs and (partially) abstract repre­sentations are part of speakers’ linguistic repertoires. They should not be thought of as either pertaining to the lexicon or being part of syntax: they are Complex Lexical Items.